Octopuses are highly intelligent sea creatures becoming popular with aquarium enthusiasts seeking a more interactive aquatic pet. Marine researchers have taught octopuses living in captivity to unscrew glass jars to obtain treats. They've also recorded them sneaking out of their own tanks to snag a snack from nearby crab tanks. Octopuses do have a rather specific set of housekeeping needs in regard to water quality and temperature: accommodate them and you'll have a worthwhile pet. Weighing in at only an ounce in their adulthood, an Atlantic Pygmy has a body, or mantle, that measures 5 inches long at the most. The smaller size makes this species less expensive to accommodate because a pricey tank is not necessary. Octopus World describes this species as playful and extremely intelligent, able to solve problems. Despite this, they still like to hide and are excellent at changing their color to match their environment. This characteristic means aquarium enthusiasts keeping this species should provide a variety of vegetation and sheltering rocks to meet his need for privacy. They are picky eaters, preferring clams. His scientific name is Octopus bimaculoides and he is often referenced as a "bimac" by octopus aficionados. His mantle can be as long as 7 inches, with its arms reaching lengths of 23 inches. A tank of at least 50 gallons is recommended. The Octopus Network Magazine Online states that the young of this species eat mainly live food such as shrimp and crabs. As they get older, the California Two-Spot expands its diet to include frozen shrimp, fresh scallops, live fiddler crabs and shore shrimp as well as catfish. They are a friendly species that will often eat food from a stick and play with Lego blocks. Sporting a dull red-and-brown color combination on the top of his body with a lighter complexion on his lower half, the red octopus makes his natural home in the eastern Pacific Ocean. PetPlace lists this species as one commonly kept in private aquariums. He likes colder water temperatures—ranging from 60 to 65 degrees Fahrenheit—making heating his tank less costly than for other species. He eats mollusks, small fish and crustaceans. O. vulgaris—which according to the Cephalopod Page is known as the "common octopus" due to its wide distribution in shallow tropical to semitropical waters—ranges in length from 24 to 36 inches, according to Broward College. While his name may be "common," his capabilities are not: National Geographic explains this species can hide in plain sight using his specialized pigmented cells to almost instantly match the colors, patterns and textures of his surroundings. This capability can lead to plenty of family fun trying to find him in the tank. Properly keeping a pet octopus is not a cheap venture. Initial purchase can be the first big hit to the pocketbook, according to How Much Is It? Prices range from $20 to $1,000—with the bulk of pet octopuses priced between $30 and $100 as of January 2013. A 70-gallon tank—which is not an unusual choice for octopus enthusiasts wanting to provide their pet with plenty of room to roam—costs about $300. Octopus eat live prey—factor in another $100 per month to meet that need. How Much Is It? : How Much Does an Octopus Cost? 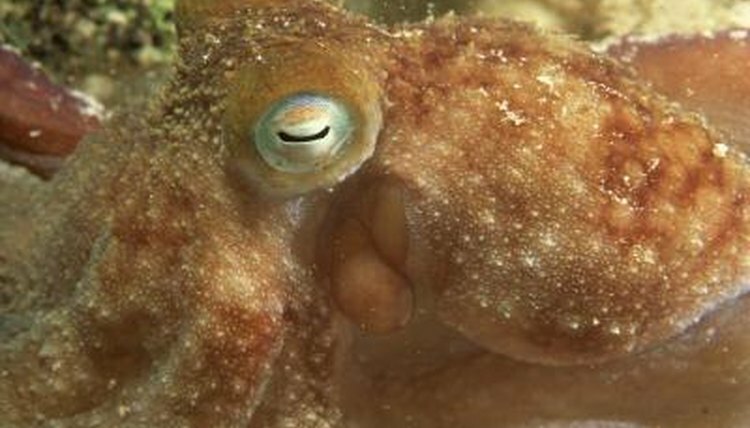 Scientific American: Are Octopuses Smart? What Are the Bright Yellow & Orange Cichlids?